"Own your soul!" your voice rings clear. For us, AE you'll never die. Boston Zonta Club is proud to welcome you as a member. A few weeks later, she was inducted into Zonta International and served as an active member first in the Boston club and later in the New York club until her tragic and untimely disappearance in 1937. An outstanding woman with a charismatic personality, Earhart was universally admired around the world for her "wildly daring" but "never reckless" courage.  Fly the Atlantic alone.  Receive the United States Distinguished Flying Cross.  Fly from Hawaii to the mainland. Epitomizing the ideals of Zonta International by actively promoting women to take on nontraditional fields, she wrote articles about aviation for Cosmopolitan magazine as an associate editor, served as a career counselor to women university students, and lectured at Zonta club meetings, urging members to interest themselves in aviation. 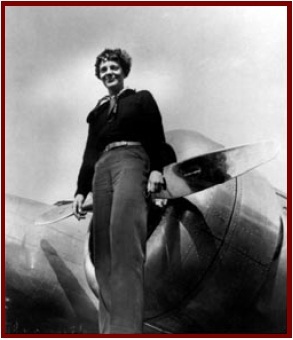 In these years, Zonta was the only non-aviation organization to which Earhart belonged, although she was besieged to join and to sponsor numerous organizations at the time. careful research that went into the blueprints for her trip." The last flight was begun in 1937 in May. On July 3 an S.O.S. was picked up from somewhere between Lae, New Guinea, and Howland Island. Exactly what happened we shall never know. Of this only we are certain: Amelia died as she lived, doing the work she loved with her whole soul. Amelia left a letter to her husband George Putnam saying, "Please know that I am quite aware of the hazards. I want to do it because I want to do it. Women must try to do things as men have tried. When they fail, their failures must be a challenge to others."